Buddhism is an interesting religion; there is no real “god” as the figurehead in the traditional sense like there is in Hinduism or Christianity. However, just like Hinduism, they strongly believe in the concept of enlightenment and freedom from the chains of earthly existence. But unlike many practices in Hinduism, their methodology rests on the concept that enlightenment doesn’t need the presence of faith. This is really evident when you start taking a look at their approach to meditation. 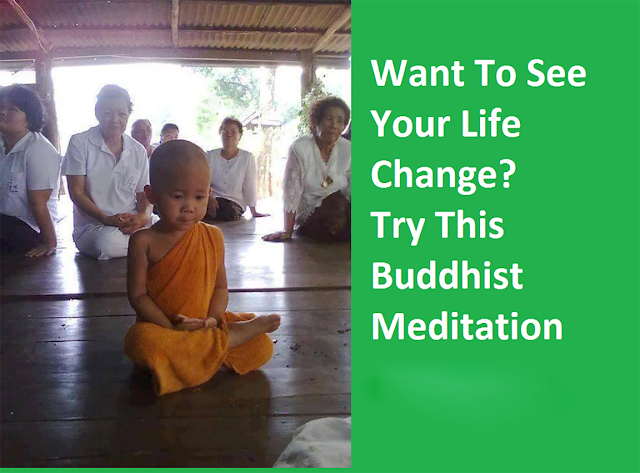 Buddhist meditation focuses on mindfulness (the practice of being present to every sensation experienced), and is encouraged as the primary way to break from the normal routine of dwelling on the past or future, and therefore free the mind. Once the mind is freed, the practitioner can begin to experience higher states of consciousness…and even enlightenment. While the concepts of enlightenment and higher states of consciousnesses are great, the process of getting there is not always easy! But it begins with small steps…and the first is learning how to meditate. First, sit-upright. You can sit in a chair or on the ground, but just make sure your spine is long. Visualize that there is a string attached to the top of your head, and someone is pulling it toward the ceiling. Once you’re comfortable, close your eyes. Take some deep breaths, shrug your shoulders. Make a conscious decision to let go of tension. Bring your hands in a prayer position, and create an intention for your meditation. It can be anything you connect with: letting go, finding peace or happiness, or just connecting on a deeper level. Begin to notice your breath. Watch as it steadily flows in and out. Become deeply aware of that gentle rhythm. It will be tempting to control the breath, but instead just watch it. Become a witness. After you’ve practiced the breath technique, you can begin to incorporate some mantras. With your lips sealed, begin to hum”ommm” continuously (this is a universal sound in both Hinduism and Buddhism). You can do this with or without verbalizing it. Visualize the sound emanating from your navel; this is the center where we feel happiness. Once you’re present, shift your attention back to the breath. But begin to focus on the silence between the inhales and exhales- let it wash it over you and consume your thoughts. Sit here in the silence for as long as possible. This is the most important part of the practice. You can mix and match the first and second techniques, but stick with silence at the end. And don’t be afraid to try different Buddhist mantras! The most important thing about meditating is establishing a normal routine! Morning, noon, or night, try and do something that’s sustainable. You can start with 5 minutes, and gradually add 5 minutes per week or month until you reach your goal.